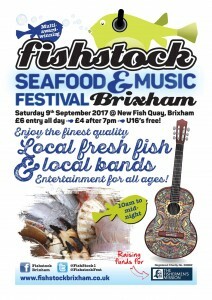 Fishstock Brixham Seafood & Music festival 2017 | SHOT BY ROB® | If I'm not there, it didn't happen! COOKERY MASTERCLASSES & INTERACTIVE WORKSHOPS from 10am on the Food is Fun South Devon College stage, plus a truly impressive line-up of VIP Chefs on Stage (including local favourites Mitch Tonks & Kirk Gosden from Rockfish, top chefs from the Quayside, Berry Head and Saunton Sands Hotels and representatives from Rick Stein’s, Curious Kitchen and Fat Belly Fred’s) all demonstrating their skills from 10am through to the evening. Festival-goers will be able to browse a truly delicious choice of LOCAL FOOD & DRINKS STANDS offering everything from Thai food, hog roast, vegetarian options, crepes, gluten-free wraps, fresh West Country cheeses, pasties and Devon cream teas with Millie & Me Pop-up Café, and – naturally – a very wide choice of ocean-fresh seafood to tickle your taste buds! In case all that makes our festival-goers thirsty, we are offering Bays Brewery, Pieroth Wines, Yarde Cider Company, Pimms Cocktail Bar, Scout & Sage Gin Bar, Tricky Cider Company, Jackz Bars, our own Fishstock Wine Bar and the Intoxicating Tea Rooms, Coffee Couture and plenty of soft drink options. Many of our favourite CRAFT AND RETAIL STALLS will be on site again, along with the usual mix of marine-related trade and information stands. FAMILY ENTERTAINMENT this year comes in the form of the Stormtroopers & UK Garrison (Star Wars characters in costume), Pauline Quirke Performing Arts Academy, Grimbles Tree Folk, Cap’n Blackheart (Brixham’s resident pirate), Zumba and Bollywood dance displays, the Funtasia Bouncy Slide, Wizzbang Children’s Entertainment and Fishermen’s Mission mascot Albert mixing with the crowds (as well as the Jump Out Jazz strolling duo). VISITING VESSELS: Brixham ocean-going trawler Barentszee and crabber William Henry will be moored up and available to go aboard, as will heritage trawler Vigilance of Brixham and our own RNLI Torbay all-weather lifeboat. Finally, music lovers will NOT be disappointed this year as we have 22 LIVE MUSIC ACTS PLAYING FROM 11AM UNTIL MIDNIGHT across the Coombe Fisheries Main Stage and FalFish Acoustic stage. The main stage is extended for 2017, which also sees the acoustic stage move indoors for the first time. Acts include headliners 3BF and a stunning line-up of rock, pop, metal, indie, folk, harmony and jazz throughout the day – full details on our web and Facebook pages but the music line-up looks to be the best ever. *Dog creche spaces are limited – please get in touch if you wish to bring your canine companion. We still have a few spaces for volunteer stewards so if you’d like FREE ALL-DAY ENTRY TO THE FESTIVAL in return for a minimum of two hours’ help, please get in touch with the team. The Herald Express and Breeze FM will be capturing the fun and atmosphere on the day, as will photographers SHOT BY ROB and Chris Slack Photography. 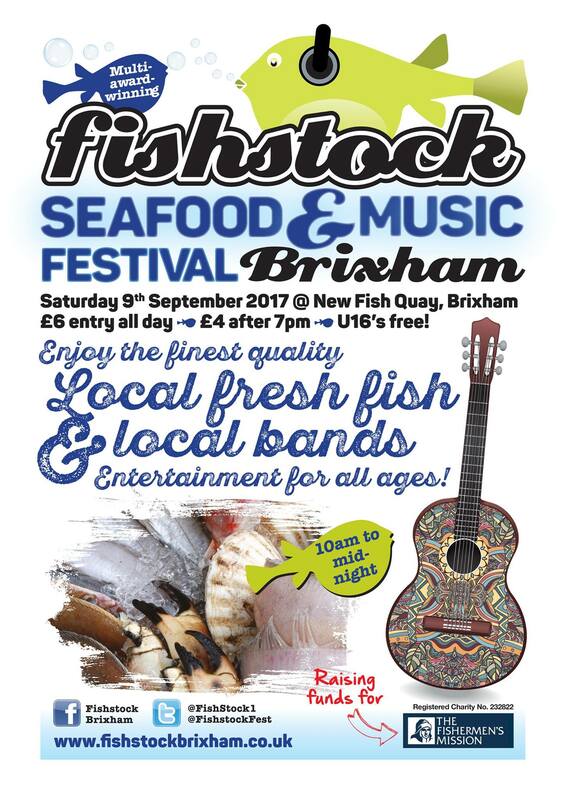 The Fishstock Team will be in distinctive blue T-shirts (look out for ‘The Boss’ Jim Portus, and Fishermen’s Mission Superintendent ‘Mission Matt’) – it’s an event not to be missed!